In November of 2015, the Museum of Contemporary Art Chicago (MCA) launched a website with a rare accessibility feature. The website team had committed to making all of the images on the site accessible to the widest possible audience—particularly visitors with vision impairment—through visual description. To do so, the MCA worked with Sina Bahram and his team at Prime Access Consulting to develop a workflow tool, backing service, and API to support a distributed description workflow. The description project, Coyote, is an outstanding illustration of the principles of universal design, which argue that products designed to be useful to one community (in this case, people who are blind or have low vision) are likely to benefit a variety of users, not just those with disabilities. Invented to solve an unresolved need at the MCA and within the community, Coyote has in a short time expanded well beyond its original scope, bringing together a team of expert and poetic describers, passionate accessibility advocates, and open source developers and bringing needed attention to the ways that visual description might become a useful aspect of museum practice. In addition to discussing the policy, institutional, and technical implications around large-scale image description, (including both short and long descriptions), we also plan on presenting the latest enhancements, made possible by a museum technology grant from the Knight Foundation, to Coyote. These include a greatly enhanced representational model that can track visual descriptions of real world objects in addition to images, integration of concepts from the semantic web to facilitate rich search, the development of an organizational model that is used to offer a centralized Coyote instance to multiple institutions in a cloud-hosted version of the software, and enhancements to the Coyote API to facilitate broader third-party access such as Coyote being used for a treasure-hunt-like game based on visual descriptions. The Coyote project takes its name from a Hopi Indian fable about a coyote who longs to emulate Skeleton Man,1 a friend who can send his eyes into far-away valleys to see once-unknowable things. Coyote, an open source software and visual description project,2 encourages people to cast their eyes onto new landscapes and describe artworks for web visitors and beyond, providing access for those who are blind or have impaired vision to the visual material that lies at the heart of a museum’s practice. In the two years since the project was founded, the project team from the Museum of Contemporary Art Chicago (MCA) has built a locally-hosted version of the Coyote software—which supports the authoring of descriptions and governs the exchange of information to and from the MCA’s web content management system—and created a cloud-hosted version of the software which can be used by institutions or individuals without the interest or capacity to maintain Coyote locally. We have trained dozens of staff members to describe images at monthly sprints and worked with them to outline some guidelines that have arisen from our work together. We have held conversations with colleagues from around the world about their description practices and worked with them to customize the Coyote software for their local environments. And, finally, we have considered the ways in which the evocative, beautiful, funny, and thoughtful visual descriptions that the team writes can become a part of the fabric of our museum’s practice, not merely a way to conform to standards for accessibility, but an essential tool for teaching, learning, and experiencing museum works that challenges staff and visitors alike to look afresh or to see anew. In 2014, the Museum of Contemporary Art Chicago began a rebranding process that would result, a year later, in a new identity developed with Dutch designers Mevis en van Deursen (Figure 1), featuring a custom font designed by Karl Nawrot. The new design was edgy, witty, and smart, an expression of the museum’s goal to create a radical welcome for our visitors, both onsite and online, and to dispel a notion that is often associated with contemporary art—that it is elitist, hard to understand, and “not for me.” The MCA’s Design, Publishing, and New Media group led the work to implement the identity, making thousands of decisions about how and where to apply the identity’s graphical features and, perhaps more importantly, its philosophies, to our new and existing platforms. The new media team chose to focus on accessibility as a key element of openness and radical welcome, hiring Sina Bahram and Prime Access Consulting in 2015 to guide the developers of a new website to meet the highest possible accessibility standards. Figure 1: Elements of the MCA’s new visual identity. Image description: A grid of nine graphic elements including black, white, blue and yellow squares amidst typographic samples. 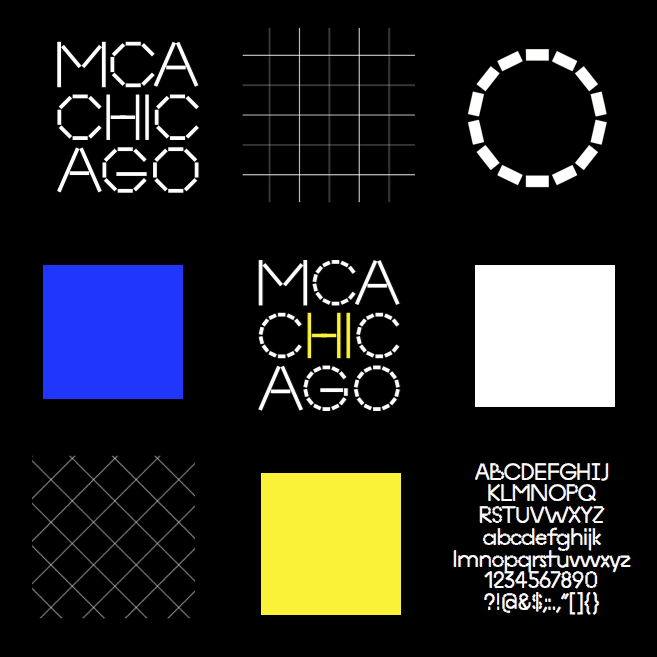 A logo for MCA Chicago in the upper right reads in three rows of all cap text MCA-CHIC-AGO; another logo has HI in the center highlighted in yellow. Working with Bahram, the MCA set a goal of meeting the Web Accessibility Initiative’s WCAG 2.0 AAA technical standard for accessibility,3 something that—to the best of our knowledge—no museum has yet done.4 Certainly we understood the advantage that building a new site from scratch offered, and between content creation and code development, many of the requirements were easily met. The site’s designer and developer, Tomas Célizna, and his team were excited to learn from Bahram about the ways that easily-implemented adjustments to their code and design practice could make web content available to a broader audience. However, with about six months until launch, we realized that we had failed to take into account one major accessibility requirement: to make the site’s images accessible for all, we would need to create visual descriptions suitable for screen readers for every image on the site. These descriptions would allow users of screen readers—generally people who are blind or have impaired vision—to experience web images through automated voice transcription. It stands to reason that visual descriptions are particularly important for visitors to museum sites, which often rely heavily on images to tell their stories. However, as we began to study peer institutions on the web, we realized that no art museum was providing image descriptions on its website on a comprehensive basis, and very few were doing any description at all, certainly not on a systematic basis or beyond their homepages, a situation that is largely unchanged today. This, of course, is understandable, when one considers the sheer numbers. The MCA, a medium-sized museum with a relatively small collection, has a website that houses more than 18,000 images of exhibitions, programs, and collection artworks. All of these images would need to be described in order to meet accessibility standards. To describe images in such quantity demands many writers, and requires a workflow management solution for the writing, reviewing, and management of many thousands of descriptions. Dedicating staff to describing obligates a museum to commit scarce resources to a service that can be seen as serving only a small number of users. On the other hand, not describing a site’s images has the effect of barring the digital doors of the museum to people without sight. And as we soon learned, the audience for descriptions goes far beyond those who are blind or have limited vision, and the rewards of a description program are shared by visitors and describers alike. This portrait depicts a young woman with jet-black skin holding a long, thin paintbrush up to a colorful, messy painter’s palette. She is shown in a three-quarter pose, gazing directly at the viewer. Her face, which is central to the square composition, stands out against a large, white canvas to her right and almost blends into the pitch-black background to her left. Closer inspection reveals, however, that her skin is subtly rendered, with various shades of contours and highlights. She wears two large hoop earrings, three small hoop earrings, and an oversized, boxy, high-collared jacket made of stiff fabric. Her voluminous hair—black with an ochre sheen—rises in thick coils on top of her head. The canvas to her right shows a partly finished paint-by-number self-portrait; in it, her likeness is broken up into smaller segments with pale-blue outlines and numbers. She has outlined many of the segments and filled them in with colors from her palette: orange, blue, yellow, pink, brown, and a few shades of green. The paint-by-number canvas does not accurately represent the color and pattern of the jacket she wears, which features mustard yellow sleeves and collar and deep blue and maroon and light yellow stripes. Figure 2. 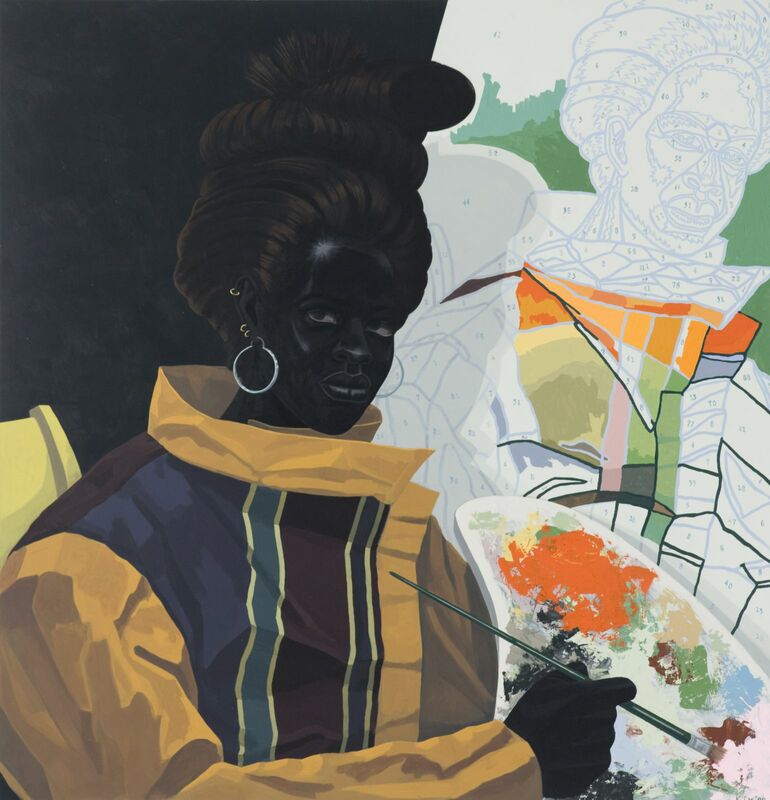 Kerry James Marshall, Untitled (Painter), 2009. Acrylic on PVC; 44 5/8 × 43 1/8 × 3 7/8 in. (113.4 × 109.5 × 9.8 cm). Collection Museum of Contemporary Art Chicago, gift of Katherine S. Schamberg by exchange, 2009.15. © 2009 Kerry James Marshall. Photo: Nathan Keay, © MCA Chicago. With some test sessions behind us and much discussion about the tools required to support a description and web integration workflow, the MCA team decided to move ahead with the newly christened Coyote project. We were inspired by visual description work being done in adjacent spaces, including accessibility work in e-books developed for the STEM space by Benetech’s DIAGRAM Center5 and by visual description offerings that were being programmed with increasing frequency by our theater colleagues in Chicago. We studied existing description projects in the museum space, including Museum Victoria’s Describe Me project,6 and the American Museum of Natural History’s Project Describe.7 Both of these projects sought crowdsourced short (or alt-text) descriptions and seemed to be enjoying some success. However, our research into existing tools or protocols turned up nothing that would provide us with the robust functionality and open architecture required for a distributed authoring workflow that could pull images requiring description from our site and push approved descriptions to our public site in real time, while storing and managing multiple descriptions of any length. Prime Access Consulting and Sina Bahram signed on to do the development work on the creation of an open source Coyote toolkit. The description workflow of the Coyote project is supported by the Coyote platform, an open source cloud-hosted web application written in Ruby on Rails with an HTML5 user interface (UI). Coyote is not an image repository. Instead, Coyote exposes a RESTful API that can be used to tell it about images that reside anywhere and are reachable by a universal resource identifier (URI). After Coyote knows about these images, it can then act as a workflow tool for synthesizing descriptions (Figure 3). In addition to images and descriptions, Coyote has a concept of a resource. A resource is anything being described, be it a sculpture, a painting, a photo, or an architectural landmark, to name a few. Because there may be multiple images of and properties about a given resource, Coyote has the ability to link resources to other resources or images through an extensible semantic triple using the Dublin Core schema. The recent integration of Dublin Core enables the implementation of features such as rich search, surfacing descriptions of related objects, multimodal presentation of description information, and more. Figure 3. View of the Coyote software’s administrative interface. 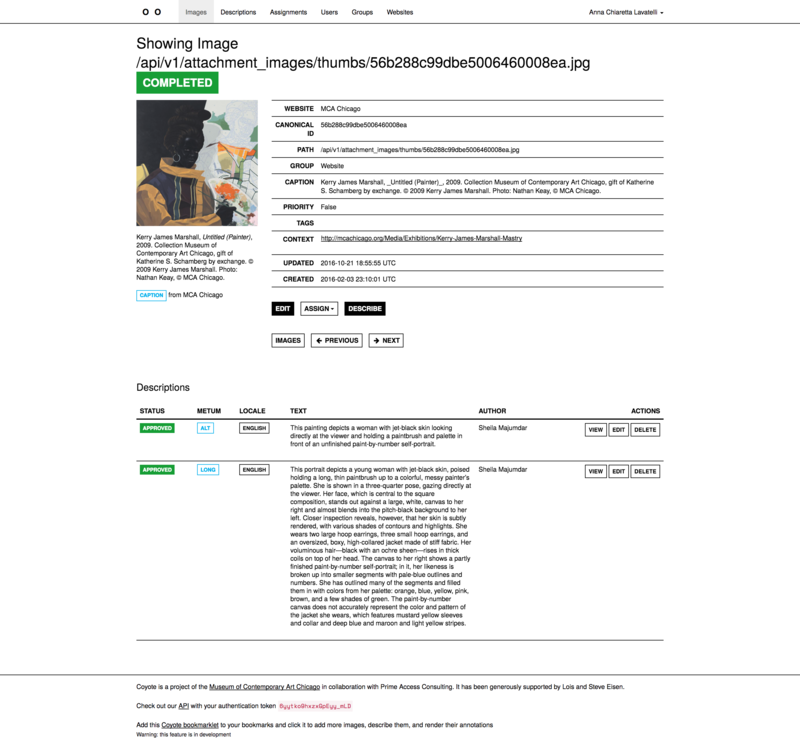 Image description: A screenshot of the Coyote interface displays the image of a Kerry James Marshall painting accompanied by record data and two descriptions, one short and one long, displayed below the image and its record information. During the initial development work and exploration with the MCA, it became clear that a simple association of images to textual strings would not be sufficient. The information needed to be contextualized along several axes. Those axes are language; the type of description (we call this a metum); and the context in which a resource is being described. This metadata model for descriptions facilitates a far richer ability to surface the right description for the right time. A complementary concept that is similarly ingrained into Coyote’s ethos is that of multiplicity of voices. The Coyote team believes strongly that there is no perfect description for a given resource; therefore, Coyote makes it easy to author or retrieve multiple descriptions for a given resource even for the same language, metum, and context. Thus, a resource may be described by many authors, and a single author may author more than one description of any resource. In addition, we chose deliberately to create an authoring interface that reveals all descriptions—approved and not approved—to any author using the system, as a way to encourage authors to learn describing techniques from each other. Coyote also tries not to assume format or mime type when reasoning about descriptions. To this end, Coyote can support descriptions being output as raw text, JSON, audio, etc. By employing the data and conceptual model laid out above, Coyote can facilitate a variety of interesting queries. Let’s break down one such query: provide an English list of poetic descriptions of a given sculpture. In this example, the sculpture in question is the resource, the metum is poetic (because the MCA is considering commissioning poets to author descriptions of some works), and the language is English. Such information is important to the description-authoring workflow because priorities and other internal considerations need to be made about authoring descriptions, timelines, etc. This is a relatively simple query for Coyote to answer, but in our experience an incredibly difficult one for various content management systems (CMS) and other platforms in the museum’s digital pipeline. This example also helps to illustrate the reality that a single static text field for description in a CMS is not sufficient. The software also offers a multi-level rights and permissions function (for the MCA, editors must approve descriptions written by authors before they can be published) and stores description-level rights information (the MCA’s descriptions are, by default, made available for reuse under terms of a Creative Commons license). In the past few years, dozens of colleagues from the museum, library, and vendor community, as well as members of the Chicago accessibility and gaming communities, have shaped Coyote through their participation in discussions, planning meetings, or software testing sessions. The larger Coyote community9 includes representatives of museums that have integrated or will integrate the Coyote software with open source CMS’s WordPress and Drupal, thus removing implementation barriers for the hundreds of museums with WP and Drupal-based sites. We are also investigating the contribution of Coyote descriptions to image libraries such as Artstor and DPLA, and hope that the broad dissemination of image descriptions will make visual description a routine aspect of digital practice. At the MCA, the Coyote project has had a transformative effect, rallying support for not just web accessibility initiatives, but accessibility projects in general.12 Description work has brought staff members from around the museum together, creating rare opportunities for collaboration between, for example, visitor services staff and curators, or educators and preparators. Describing has proven a valuable group experience, raising important questions about how we talk about art and creating a renewed empathy for visitors who may approach art in general and contemporary art in particular without a priori knowledge of art history and its jargon. But our descriptions are not limited to artworks alone. Although much of the attention that Coyote has received is about the descriptions that we have written about works of art, the team also describes images of performances, programs, retail items, and other website content. The describers’ questions and the editorial review process contribute to an ever-evolving description style guide. The MCA’s style guide is based on institutional preferences, emerging norms, and practical considerations. It augments the “Art Beyond Sight” guidelines13 that were the basis of our training and, at times, upends the received knowledge about visual description. For example, we have chosen to create “alt” or short descriptions that, in many cases, exceed the traditional recommended length of 10 words, and long descriptions that may constitute a paragraph or more, in order to fully capture the important visual information that makes an artwork truly understandable. The team believes that while local style guides of this sort may vary widely between institutions, in time guidelines shared between many institutions will produce an emergent standard. The Coyote description group, which continues to expand, now meets at a monthly “Donuts for Descriptions” workshop, with pastries supplied by a generous local vendor (Figure 4). Removing our interpretive lens to describe objectively has enabled us to look at the works displayed on our walls more closely, and converse more deeply about what is visually (and culturally) significant in a work, all the while improving our guidelines as we learn to describe together. Figure 4. Donuts for Descriptions authoring sprint, spring 2017. 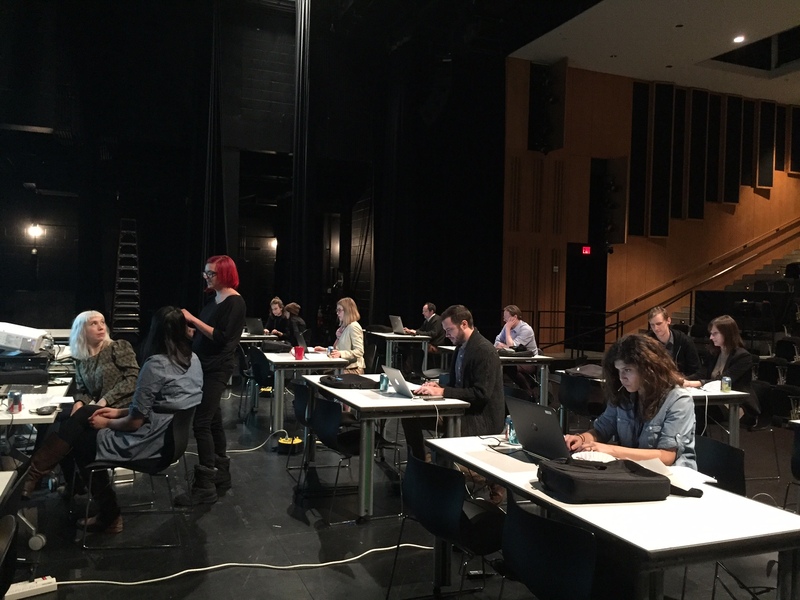 Image description: Eleven people sit in front of laptops spread over a grid of tables on a theater stage, some in pairs and some on their own. Two women look over their shoulders to a third standing talking with them. As we presented our work to colleagues and members of the disability community, many people commented on the beauty, wit, and poetry of the language that MCA staff and Coyote partners were generating. These discussions suggested that descriptions would be valuable for showing all web users a new way to approach artworks and images on our website. We decided to share descriptions in an opt-in public description layer available to any website visitor. To do this, we worked with our web designer and developer to use Coyote’s RESTful API to automatically pull any approved descriptions from Coyote and present them as text previews appearing on the images themselves (Figure 5). Figure 5. Description layer, showing Coyote-authored descriptions on the MCA’s public website, mcachicago.org. 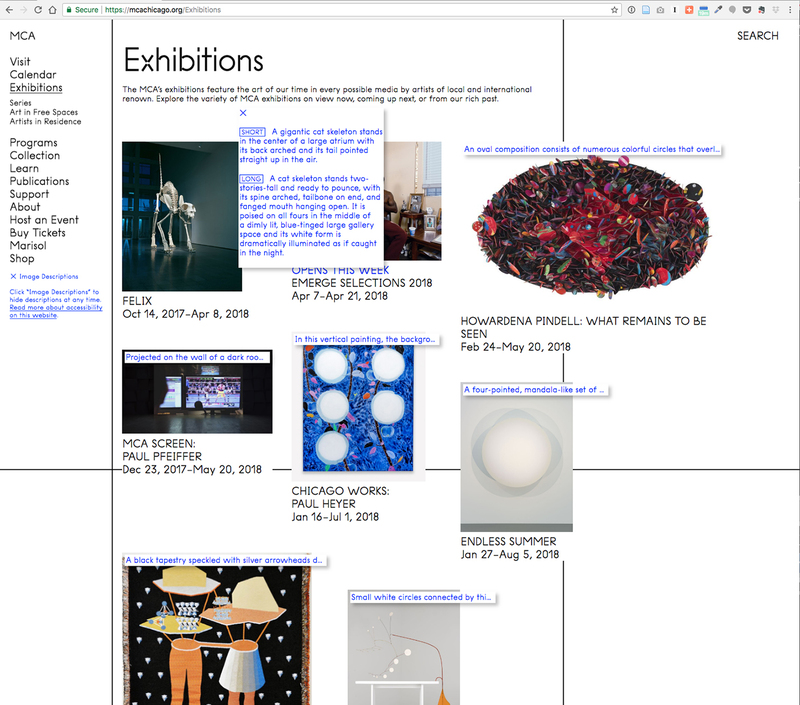 Image description: A screenshot of the exhibitions page on the MCA Chicago website shows several images, at the top of which white boxes with blue text are overlaid. One box is expanded to display a short and long description of a giant cat skeleton. The prompt to enable the image description layer is conveniently located beneath the MCA website’s main navigation menu. When clicked, a preview of descriptions appears over any images on the site that have approved descriptions associated with them. Users can then click the description preview to see the expanded, full-text versions of any available descriptions. The public image description layer also increases awareness of digital accessibility, furthering one of the key goals of the Coyote initiative: encouraging systematic use of visual description by all museums. It serves as a recruitment tool for new members of the Coyote project—describers see their work on public display, and potential institutional adopters have a demonstration that they can share with decision makers who might be reluctant to establish description programs: evidence that visual description can serve visitors beyond the limited community of screen reader-equipped users. The Coyote image description layer is a unique offering, the first resource of its kind to be implemented by a museum, though not, we hope, the last. To that end, Sina Bahram is currently working with colleagues from The Diagram Center to replicate the MCA’s visible description layer as the reference implementation for publishers wishing to surface such information in their e-books. Though the Diagram Center’s interest in the project is focused on making e-books accessible to all audiences, the aforementioned reference recommendation will make it easy for any museum to integrate Coyote descriptions into their websites. For the Coyote team, what once seemed an insurmountable problem—describing tens of thousands of works of art—has resulted in a flowering of ideas about the value of description for museums. Soon after describing at the MCA began in earnest, Sina Bahram suggested that the end goal of the Coyote project might be to create a database of descriptions for every artwork in the world. His impulse, however Quixotic, aligns with the museum’s mission to create and archive content of enduring value about our collections. And, once collected and networked, this content has applications well beyond the project’s original constituents (people who have a visual disability) and platform (the web). We are keenly interested in the research applications for descriptions, believing them to be a tool that will yield fascinating insights into how humans see and think. At the MCA, we have begun asking the living artists who come to install exhibitions in our galleries to describe a work on camera for us, and look forward to a time when we have collected enough such descriptions to mine the language that artists use to describe their own work for insights into artistic practice. Our artists, in turn, have taken their learnings about describing and applied them to the artist-led touch tours that we offer for visitors who are blind or have low vision. Formal evaluation of the length, language, and approach of our descriptions, a future task for the Coyote project, will help us to understand the value of different types of descriptions for visitors of varying ages, abilities, backgrounds, and training. We hope that evaluation findings will help our staff to write descriptions and labels that bridge existing gaps in interpretive content. Colleagues with whom we have discussed possible evaluation methods have a range of ideas about what might be learned from the review of descriptions: for example, a colleague who works for the museums of a distinguished Ivy League university has indicated an interest in using description to reveal unconscious bias amongst staff members. The MCA’s initial evaluation activities will likely focus on the value of descriptions for people with low vision and—in keeping with our current focus on global art—on how description might be used to help visitors better understand the art of other cultures. During Museums and the Web Asia’s 2016 meetings in Wuhan and Shanghai, we began some helpful explorations of the differences between descriptions of Chinese works authored by natives of China and those authored by Westerners, and vice versa. We were particularly interested in ways in which religious iconography and historical events might be described by people with little or no understanding of, for example, Buddhist deities or Biblical figures. In the coming months, multilingual functionality, already available in the current version of the Coyote software, may be significantly enhanced by a boost to the authoring interface. Final arrangements for this contribution are currently underway with an Asian museum. The MCA’s most recent Coyote project expands the use of descriptions in several directions. With generous support from a John S. and James L. Knight Foundation museum technology grant,16 the museum will partner with cultural institutions throughout the Chicagoland area to develop a citywide scavenger hunt that uses Coyote-authored descriptions of objects and artworks as clues. We believe that a scavenger hunt that leverages descriptions of works for a sighted audience will have several positive outcomes. Scavenger hunts have long been a popular activity in museums: they are social, explorative, and rewarding. They can be a useful tool for engagement in the gallery for self-guided groups or families, and encourage the exploration of less familiar spaces within a museum. Our scavenger hunt will, we believe, support these familiar goals and introduce some new ones. Pedagogically, it will introduce visitors to the idea of description, and encourage the association of words and images, strengthening the visualization skills of visitors. We are also interested in updating the traditional scavenger hunt by translating it to a digital platform and introducing formal gaming elements. Our exploration of these ideas led to a one-day workshop that brought together members of Chicago’s highly regarded gaming community with representatives from its cultural organizations to brainstorm the competitive aspects of the hunt. The Knight grant has also created several important opportunities for the Coyote project. The focus on a real-time, real-world scavenger hunt shifted our approach away from the exclusive description of images to the description of real-world objects and the built world. To do so, we planned a radical update to the Coyote data schema (described in the Software section of this paper), to enable the system to recognize differences between and relationships of resources (artworks, architecture) and representations (images, recordings), setting the stage for an ever expanding array of applications for descriptions. Perhaps the biggest goal of the Knight-funded project, though, was to increase the number of cultural organizations actively participating in description work. We recognized that at a time when many institutions are struggling to balance budgets and maintain staffing levels, few institutions would be in a position to initiate a program that not only adds ongoing tasks for any number of staff members, but that requires technical expertise to implement and integrate a new set of software tools. We hoped to reduce barriers to participation by making it much easier for partners to begin a program of describing. To do so, the MCA worked with Bahram to develop a cloud-hosted version of the software suitable for use by multiple institutions, each with their own set of rules and permissions (for now, a single shared account will be used to power the multi-institutional scavenger hunt). The introduction of the cloud-hosted version, an alternative to a locally-hosted version of the software, removes the requirement to support a new software tool that would likely have kept many institutions from adopting Coyote. And participating in the city-wide scavenger hunt requires that institutions describe only a handful of works, a less daunting starting point than committing to describing an entire website. To prepare for the launch of a Chicago-wide real-time scavenger hunt—a day of exploration and discovery—in summer 2018, the MCA has been offering a paper prototype (Figure 6) at its monthly Family Day since the fall of 2017. Descriptions are authored by the museum’s exhibition artists, artist guides, and staff, and simple evaluation data is tracked on an ongoing basis. 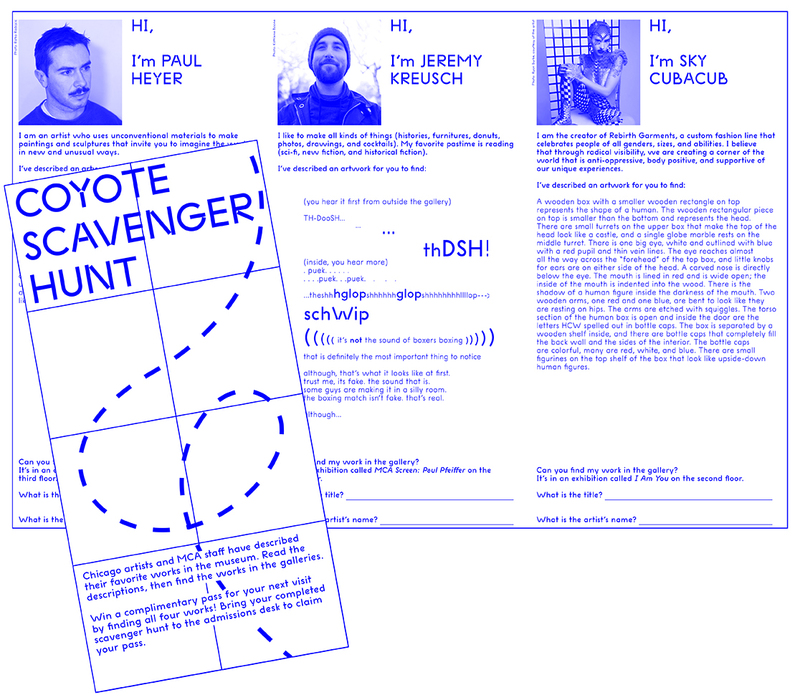 The feedback gathered from these prototypes is informing the open-source web-based Coyote Scavenger Hunt. The scavenger hunt project provides a new application for descriptions in the sighted community, while encouraging more institutions to participate in the act of describing, laying the groundwork for accessible experiences across our city. Figure 6. The paper prototype of the Coyote Scavenger Hunt distributed at our admissions desk and at monthly Family Days. Image description: A tri-fold brochure features portraits and introductions above descriptions of artworks; an image of the cover reading COYOTE SCAVENGER HUNT overlays the opened-up brochure. Coyote serves as an outstanding illustration of the principles of universal design, which argue that products designed to be useful to one community (in this case, people who are blind or have low vision) are likely to benefit a variety of users, not just those with disabilities. We invented the Coyote platform to solve a deep unresolved need within our institution to enhance access for an audience that has traditionally been ignored. Through our continued work on the project, we’ve learned that this need is shared amongst many of our peers, which is why all work on Coyote is open source and publicly available. We’ve also learned that more scholarship is necessary to make strong claims about institutional voice, description practice, and increased artist involvement in inclusion efforts. Making the world’s culture accessible is not a journey that can be undertaken by a select few. It requires support and active participation from all of us who believe that access, independent of functional ability, is a fundamental human right. Bahram, Sina and Lavatelli, Anna Chiaretta. "Using Coyote to Describe the World." MW18: MW 2018. Published April 17, 2018. Consulted .